It looks like President Barack Obama won in more than one way yesterday. The Democratic incumbent not only locked down a second term at the ballot box, but also finished his campaign as the undisputed victor of the social media battle with his opponent, Governor Mitt Romney. During the home stretch of this year’s campaign, HootSuite’s 2012 Election Tracker showed political junkies just how well each of the two presidential candidates were faring on social media. Yesterday, as election-related activity on Twitter and Facebook reached a fever pitch, Obama leaped ahead of Romney on the Election Tracker and into the social media record books. Obama practically wrote the social media playbook for politicians during his 2008 campaign, mobilizing millions of supporters to defeat Hillary Clinton, the favorite for the Democratic nomination, and then Republican John McCain in the general election. Unsurprisingly, he began his reelection effort with a huge edge in support on social media. Even as the race tightened in the closing weeks of this year’s campaign, President Obama maintained a substantial lead in both Facebook likes and Twitter followers over Governor Romney. By the end of the campaign, Obama had 22.7 million followers and 32.2 million likes, compared to Romney’s 1.8 million followers and 12.1 million likes. HootSuite’s Election Tracker showed that Twitter mentions of @BarackObama and @MittRomney remained much closer, however. During the debates in October, @MittRomney’s mentions surged along with his noticeable bump in the polls. For the same reason political scientists poll for approval rating, not just name recognition, HootSuite’s Election Tracker monitors more than just how much social media attention the candidates have generated. 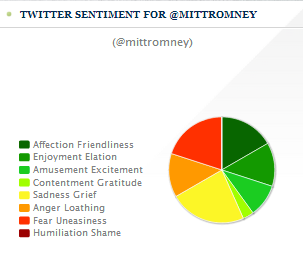 The Election Tracker reveals how social media users actually feel about Barack Obama and Mitt Romney, with Twitter sentiment analysis powered by Lymbix, a global leader in sentiment analysis technology. Lymbix has relied on both natural language processing and crowd-sourcing to create a tool that can hear the nuances of tone in human language. Lymbix’s engine goes beyond the typical positive/negative categorization to measure the intensity of eight specific emotions, giving our Election Tracker two very colorful pie charts. Since we launched the Election Tracker, both candidates’ charts have been predominantly green, showing more affection, elation, excitement and gratitude than sadness, anger, fear and shame. However, there were always noticeable portions of “Fear/Uneasiness” tweets for both candidates, hinting at just how worried both Republicans and Democrats were about the prospect of defeat. Throughout Tuesday, the Barack Obama chart was very green, with a high proportion of his positive Twitter mentions marked “Enjoyment/Elation”. Clearly, his supporters were expecting a victory. In the mentions category, @BarackObama pulled away from @MittRomney as hundreds of thousands of tweets flooded Twitter. After major news organizations called the election for the president last night, his campaign posted an image of Barack and Michelle Obama in a loving embrace, accompanied by the message, “Four more years.” The image has set two social media records already, receiving more Twitter retweets (700,000) and Facebook likes (3.5 million) than any other post in history.